Luci Baines Johnson surveys the expansive two-story house on the Johnson Ranch near Stonewall and says, “My daddy loved this place. He used to say two days here did him more good than most people got from two weeks in the Caribbean.” That’s easy to understand when strolling the grounds. Serene views of the Pedernales River are just a short walk away or a glance out the window. 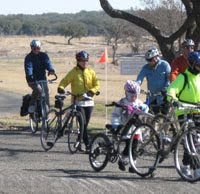 You can ride with Luci around the ranch LBJ loved on Saturday, March 27 when Lyndon B. Johnson National Historical Park hosts the third annual LBJ 100 Bicycle Tour. Luci Baines Johnson, younger daughter of Lyndon and “Lady Bird”, officially starts the 32, 45, and 62-mile (100 kilometer) rides at 9:00 a.m. from the historic ranch airstrip adjacent to the Texas White House. 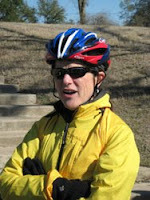 At 2:00 p.m. she will lead an easy seven-mile ride around the ranch. This special ride includes reminiscences and stories about her parents and life on the ranch in the 1960s and includes several stops at various historic locations. Surrounded by magnificent live oak trees, the house harbors years of vivid memories for Luci, whose parents bought it from her widowed aunt when she was just five years old. “I don’t remember not coming here,” she says. Luci speaks from her heart, sharing stories about her family that only friends will hear. For three hours on a chilly Saturday in 2008, my husband Larry and I were counted among her many friends as we rode with Johnson on the LBJ Ranch Bike Tour, held as a fundraiser by Friends of LBJ National Historical Park. That day more than 100 participants gathered at the parking lot of the LBJ State Park and Historic Site Visitor Center (there is both a state park and a national park). Riders of all ages came from as far away as South Dakota and Minnesota. Bikers rode on skinny tires and fat ones, pulling baby carts, and tending young children riding on their own wheels. One couple had a bicycle built for two, and another couple leaned back in their easy-riding recumbent bikes. President and Mrs. Johnson donated their ranch to the National Park Service prior to his death in 1972. Because Mrs. Johnson continued living there, public access to the property was limited to guided bus tours. After her death in July 2007, the national park service began expanding public access to the home, and several areas are now open for viewing. On our tour we rode to Park Road 1, which parallels the Pedernales River. With little car traffic, riders spread out peddling past a herd of buffalo, the Trinity Lutheran Church, and rest area with picnic tables. We turned left and followed our guide across the river on a bridge. On a paved road we head toward the one-room Junction School, where Lyndon Johnson’s formal education began at age four. Our next stop was LBJs birthplace, just down the road. Despite his worldly travels and international career, her father was born and buried within a mile’s radius, Luci explains. 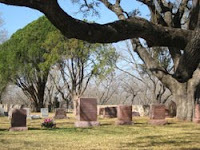 Across the road is the Johnson Family Cemetery, with LBJ’s headstone marked by the Presidential seal and Lady Bird’s final resting place designated with a bouquet of flowers. “Daddy used to walk here after dinner,” Luci said. “It wasn’t a sad place but a place of peace and serenity.” Branches from huge oak trees hover like angels guarding memories of her loved ones. We rode to the ranch house, also known as the Texas White House. Luci, who now lives 60 miles away in Austin, acknowledged how much the home meant to her family; her children and grandchildren had come all their lives, and she was married there with a reception in the hangar. She enjoyed hearing personal stories from riders of ways her daddy had touched their lives. She feels a mission to share this historic spot and hopes events like the bike tour, billed as “A Ride to Preserve History,” will encourage more people to experience the park in novel ways.